I try to adhere to a schedule of posting a new column regularly on Mondays and Fridays. At times, Monday has turned into Tuesday, but for the most part, I try to follow a set schedule. There are times when a midweek entry is deemed a necessity, and on occasion I’ll throw in the stray guest column or educator interview – I know, the great Tim Drinkwine interview is still lost to wander in editing purgatory. This being the last week before election day, the last thing on my radar was the writing of a midweek piece. Unfortunately, the fates conspired against me, and a number of events occurred that couldn’t be left until Friday without comment. So here we are with a special midweek edition. The week kicked off with a special report from Phil Williams at Channel 5 News covering the accusations against JFK Middle School principal Sam Braden. Due to the story’s prurient nature, it could only be aired at 10pm. I think it’s safe to say that most viewers found the story extremely disconcerting. If the accusations hold to be true, then once again, MNPS Human Resources has dropped the ball. It needs to be noted that before stories of this nature even hit the air, they are excruciatingly vetted by the news station’s legal department. I think, at times, there is a misconception that reporters write and air stories with little vetting. Nothing could be further from the truth. Legal makes damn sure that facts are verified and that the station faces as little legal exposure as possible. While the story that aired is disturbing enough, it’s the documentation from MNPS files that is shared online by Channel 5 that pushes things over the top. It’s 130 pages long, filled with accusations against Braden and little indication of action by MNPS. That should be unacceptable to everybody, and there should be some accountability when a task of this magnitude fails to get properly completed. Unfortunately, MNPS prefers to circle the wagons rather than address its failings in a transparent manner. Word on the street is that Braden is not going anywhere. Dr. Joseph is going to leave him in place as the principal at JFK MS. How anybody thinks he can be effective in light of recent events is a mystery to me. But if you think about it, the strategy is no different than that employed over the last two years at Antioch HS. Deny, deny, deny, and when you can’t deny anymore… deny some more. After three years as the head of MNPS English Learners program, Kevin Stacey resigned as Executive Director of EL two months ago and was replaced by Director Molly Stovall. Instead of posting the opening, conducting interviews, checking references, and hiring the best candidate to take Stovall’s place, Director of Schools Shawn Joseph promoted former Prince George’s County colleague and current principal of Paragon Mills ES, Dr. Joie Austria, to the position. This move has raised some eyebrows because Austria’s tenure at Paragon Mills, by most accounts, could be, at best, considered a troubled one. Internal climate surveys did not paint a picture of an administrator who was deft at handling staff. There were also questions in relation to Austria’s qualifications for the position. Let’s hop in the way-back machine for a second, and head back to January of 2017. That’s when Channel 5 News ran the story about several principal transplants who were not properly licensed in the state of Tennessee. Austria was among that group, and she had just become licensed in December after being employed by MNPS for nearly 6 months. Apparently that mistake was not an outlier. When checking the TN Department of Education website and looking her up by her legal name, Maria Delores Nones Austria, I find that she has a Beginning Administrator License (ILL-B) with an endorsement for “Beginning Administrator PreK-12.” What she doesn’t have is an endorsement for English Learner Instruction. Wait a minute. I had to check again. When I looked again at her licenses in Tennessee, something curious caught my eye. As of July 10, 2018, just two weeks ago, Austria was issued a “Practitioner Teacher” License with endorsements in both English 6-12 and ESL PreK-12. A practitioner teacher license is what is issued to a beginning teacher. Someone who is just starting out in the classroom. This begs the question: does she have the necessary experience to lead the English Learners program in this district considering she was only recently granted a beginning teacher license with an ESL endorsement in Tennessee? How does that make her qualified to lead this very important part of MNPS? How does this not get caught by HR as a red flag? What exactly are the qualifications for a high level position such as this? Is this beginning teacher license the kind of qualifications needed for this position? It just doesn’t seem right. And given that she served in this position for months without any kind of EL certification or endorsement at all, I have to ask: is this the importance that we attach to the instruction of some of our most neediest kids? A meeting is scheduled later this month between leaders of the immigrant and refugee community and Dr. Joseph. I hope that someone demands some accountability for this shortcoming. Having a second-in-command who does not hold the proper credentials or experience should not be acceptable to anyone. But what do I know? The MNPS District 6 school board race gets weirder and weirder everyday. A couple of weeks ago, there was a forum held, and all the candidates were invited to participate. The incumbent, Tyese Hunter, chose not to attend this one. All other candidates were in attendance. I was alerted that some information shared during Saturday’s District 6 School Board Candidate Forum may not have been accurate according to Metro Schools. I received the following information today from Metro Nashville Public Schools as a means of correcting any inaccuracies shared by candidates during the forum. Please contact Metro Schools directly for any additional clarification or information. Two days later, a fact sheet from MNPS was posted. Huh? 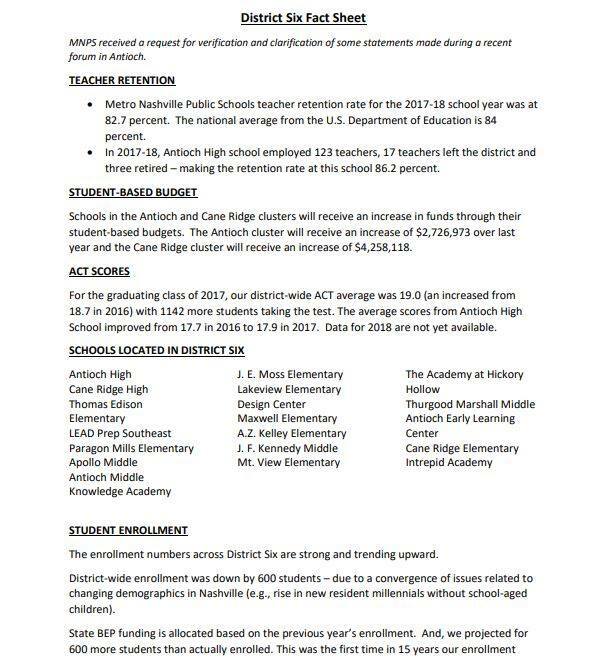 I’m not even going to get into a debate about the veracity of the “fact sheet,” though I have to wonder how it is that on social media two weeks ago, Antioch HS had 37 openings, while according to the “fact sheet” only 17 teachers left. That’s some new math. What I find concerning is that MNPS feels compelled to fact check a forum where the incumbent was not present. In other words, they are refuting statements made by her challengers that bring into question her effectiveness. That’s not their job, and in my opinion, crosses the line into Little Hatch Territory (Hatch Act). If there were inaccuracies stated at the forum, it’s the job of the incumbent to counter argue. It is not the school district’s place to paint challengers as misinformed by doing the incumbent’s job. By weighing in here, MNPS is putting the candidates at a disadvantage. Not only are they now battling for the seat, but they are fighting against the district. Very troubling. It has been an absolutely horrible summer for the MNPS Human Resources Department. In fact, I’d argue that under the leadership of Deborah Story and Sharon Pertiller, the department has plunged to new depths and regularly fails to meet the needs of the MNPS staff, whom they are supposed to serve. Yesterday, Pertiller presented the recently agreed upon Memorandum of Understanding (MOU) between the service unions and MNPS. It was a 30-minute presentation, and it was clear to everyone watching that she wanted to be anywhere but at that meeting explaining employee rights. These MOU’s are a huge deal that represents a great deal of work from all sides. They deserve more than a cursory explanation that leaves principals with more questions than answers. The intent is to improve the climate at MNPS. Yet, Pertiller refuses to place any investment in them. Without HR’s full support, these agreements become toothless. Coupled with all the other errors made by HR this summer, one has to wonder what is it going to take before Dr. Joseph holds them accountable? Based on the way investigations into sexual misconduct have recently been handled, could an employee, if needed, count on HR? 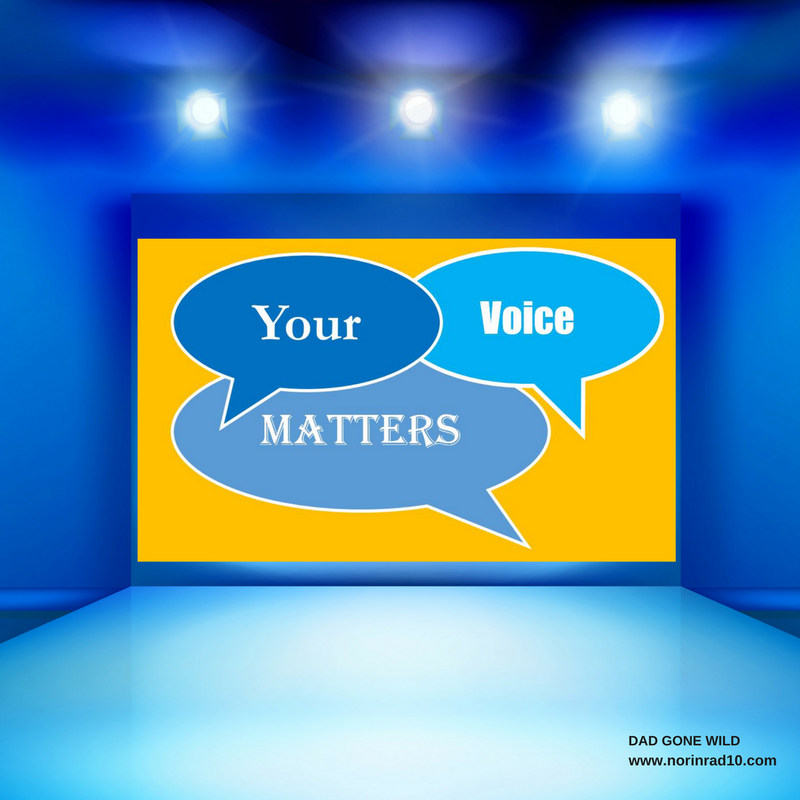 Where would an employee turn to with the expectation of fair treatment if placed in an untenable position? Who’s going to enforce the MOU, seeing as the heads of HR seem, at best, unfamiliar with its contents? The Human Resources Department can not continue to conduct business as they have over the last year. The department heads seem under the impression that their primary job responsibility is to protect Dr. Joseph. Sadly they’ve been allowed to continue under this illusion. Hey, I’ve got an idea. Maybe the Communications Department could create a “fact sheet” on the responsibilities and obligations of the Human Resources Department. That could prove helpful. That’s it for today. Early voting is going on as we speak until Saturday. Please, if you want to change the conversation, and you live in District 2, get out the vote for Thomas Weber. Also, if you are so inclined, check out my new campaign web page and sign up to help if you can. I need every vote. Next IS THIS THING ON? Shades of Washington, with Joseph operating his personal White House. Sadly, his subjects seem all too willing to compromise themselves to maintain his favor. MNPS operates like a seedy business in a bad movie. These are OUR CHILDREN. >Word on the street is that Braden is not going anywhere. Dr. Joseph is going to leave him in place as the principal at JFK MS.
one has to wonder if he was a different skin color if this would be the case. Someone needs to see if Sam Braden is a frat brother. MNEA president was interviewed on Channel 5 and suggested that EEOC charges might be filed against Braden. I think the district should be charged as well. HR is full of Joseph’s people. They cannot recruit teachers, much less protect them. Who would want to work for this district unless you are from Prince George County? I am thinking that when you transfer your license from MD to TN, they probably hand you a Professional License for TN if that is what you had in MD. And if you had a Practicioner License in MD they hand you a Practicioner License for TN. The most simple explanation is that she let her teaching licenses from MD lapse after becoming an administrator. Probably only had an admin license at that point. So she had to start all over for the ELA and ESL licenses. All that might be wrong but it is the simplest explanation. Read the linked article from last year when she didn’t have her administrators license. Perhaps I can help with license issues.. I was a Teacher in another state and TN would not accept it as it was issued a long time ago..(1996) and despite being current in my state and having the credentials we must make money for the testing agencies. So I had to take all the tests for what I was certified for at 140 bucks a pop, go hours to a location outside of my City for 3 hours, sit and take bizarre tests that were broad in scope and scale and frankly useless. Wait months for results then when done send them to TN which screwed up on my issue as they don’t have enough staff, so the first person I dealt with was a retiree then she went back to retirement and another person took over. Cut to the chase 6 months later I was given an “apprentice” license with NO endorsements despite all the specific tests I took in each endorsed area. That took quite a bit of follow up and another former temp retiree who fixed that. Then suddenly MNPS says my newly issued license has expired. Really? So then more communication with an individual at MNPS who was a temp and took months to adjust that correctly to ensure I received the pay I was due. Again all of this is quite an expense as in my state I was endorsed in English, History, Social Studies, Sociology without a single test every administered to get said endorsements, just two B.A.’s in Sociology and English. But here I have to take tests to teach any subject that I used to teach from History to Economics. I stopped after the costs became too untenable so I took English and History exams with the idea that if I took a full time job I could update my license when I had income or saw need, etc. Well that went out the window after realizing this was not something I wished to pursue. I sub and it seems to either confuse or relieve actual Teachers when I show up. That is for another time on how that is addressed or dismissed. Another reason why I am packing my kit and leaving once said license expires. I doubt any of these Admins dealt with it and I assume the district paid for it or not but still the tests had to be done, processed etc. I believe there was one Exec Admin who left over this issue. It is massively complex and frankly stupid as how some bizarre test that is broad in scope and scale will tell you how good a Teacher you will be should have been the red flag warning. Hoops and jumping for a lowly paid gig all which you pay for for the privilege of working.. says it all. Ask the Teacher from Finland who came here and they made her get another degree to Teach as they did not accept her foreign credentials. The article in the Atlantic was quite telling: https://www.theatlantic.com/education/archive/2016/11/when-finnish-teachers-work-in-americas-public-schools/508685/ Note: she is an ESL teacher…..
Yikes. District used to have someone that interfaced the state on all these issues but that’s been gone from the first few months after Joseph arrived. I watched a video online last night on Scoop Nashville’s Facebook page. It was a cellphone video of residents of Cayce Homes beating a fellow resident senseless. They just took turns kicking, punching, and slapping a man. People just stood around and watched. One person watching was a young girl about 4 to 5 years of age. She didn’t cry or try to move away. It seemed normal to her. She is growing up in an environment worse than a war torn country. This is her norm. For this little girl and so many like her, education may be her only ticket for a better life. Many will not live that long. They see their friends gunned down on the streets and accept it as a part of their every day. They are surrounded by drugs and violence. Teen boys post photographs with guns in their hands, wads of money in their teeth, and gang symbols and vulgarity with the fingers. Many of them post pictures of themselves next to the graves of their peers. Part of me thinks one reason Dr. Joseph was selected was to be a role model for our young people. He looked like them and he was different from all of those from the past. It would have been ideal if he did what was best for these children, and immigrant children, and local children from families one missed paycheck from living on the streets. It would have been ideal for our gifted children, and our children from affluent homes who wanted a good education in a diverse population that resembles the real world. He promised leadership to help all children. Instead of being that role model and reaching out to all communities, he takes away reading programs that might have saved them. Instead of ensuring that the water in the schools was safe to drink, he helped cover it up putting our already hungry children at risk for lead poisoning. Instead of finding the best teachers possible by recruiting with great salaries, he made teacher salaries a low priority and the recruits never came. He pushed away great teachers and leaders to make his point and hire friends, even though their expertise does not exist. Instead of ensuring that the learning environments be safe physically and emotionally for all children and staff, he swept sleaze and sexual harassment under the rug. Instead of facing the problem head on and cleaning it up, Dr. Joseph read the riot act to principals, threatened them about gossip, and sent a laundry list of things he hasn’t been willing to do as a leader to teachers. The director of schools is the person charged with leading education the city. The purpose of that education is to give hope for the future for all of our children for a better life, in a safe environment, with the ability to support themselves and their families with a good legal job. When the director puts himself and his feeling of importance above the tasks needed to do his job, what real hope do our children have? Maybe Nashville made a mistake when they hired Dr. Joseph? Maybe Nashville isn’t a good fit for him? What I do know is that the little girl who watches her neighbor get beat up, and her fellow students from all walks of life in our city who simply want a better future with the actual skills to make that happen, aren’t getting that leadership right now. It has everything to do with the shady way that MNPS reports out their teacher turnover rate, because it is That Bad. The number that represents “teachers left” does not include the very large numbers of teachers leaving every school, every year, who are retiring, many of whom before their time, choosing to take a cut in their pension because they are beyond spent. I was one of those. The year that my high school got a new principal, hand picked and imposed by Dr. Register and Jay Steele, morale dropped drastically, and 15+ teachers walked at the end of the year (20+%). The next year, 15+ more; and the next, 15+ more (the year I walked). This was a school which for years and years enjoyed very low turnover: now, it’s almost a complete turnover, almost all new faces, with low morale. But you would never know that, from the stats reported by central office. The only numbers reported as “teachers left” are people who quit outright. So AHS had 37 teachers leave; or, they had numerous openings through the year last year that remained unfilled. Either way, it’s a story that MNPS needs to own. And no matter what they say, no way do I believe that “only” 17 teachers left. For sure, that number is higher.